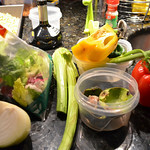 Here’s an easy twist on a Mediterranean Fatoosh Salad. We didn’t have some of the ingredients that the recipe called for, but had some other things laying around….so I reinvented the recipe. Toast the bread until it is extra crispy. You could add olive oil and zatar. I didn’t. Crisp the chick’n in a non-stick skillet. no oil needed. In a salad bowl, toss in the salad greens (chop them finer if you wish). Add the chopped veggies. Make dressing: In a small bowl, whisk the olive oil, red wine vinegar, agave and lime juice. Add in the basil & parsley. 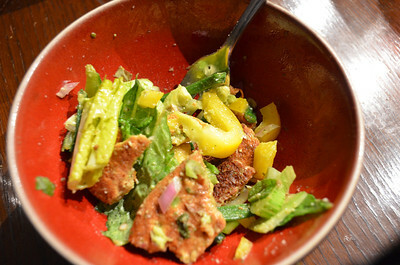 This entry was posted in main dish, Recipes, side and tagged avocado, bell pepper, CSA, fatoosh, recipe, salad, vegetarian. Bookmark the permalink. This looks so good. I love fennel in salads but it’s not in season for us yet. yeah it’s not really in season here either–this fennel came from whole foods…and clearly originated somewhere else.